Quite better, Google had announced the Android P (Android Pie, maybe), for the android app developers community. Well, it is the right time for the developers to peep into for developing polished app while infusing some little extra innovation and awesomeness. Processing further, this time it’s the Android P that will suffice all the development paradigms and will make your smartphone all the way smarter. So, probably you can now see that update button right on your home screen and yes, there are some features all well that will be witnessed by the users. Let’s find out what are they? 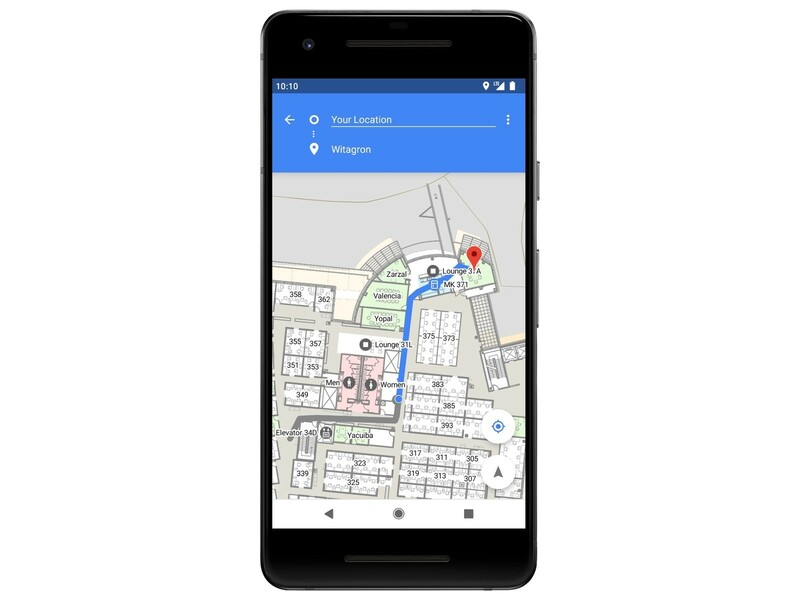 Google Maps are already a big hit and with the Android P this time, the concept of indoor positioning is on the verge of getting more advanced. Unlike Google Maps that helps you to determine the outdoors routes, Android P will help to figure out the inside routes, by harnessing the benefits of Wi-Fi Real Trip Time( RTT). The stated feature in 802.11mc will allow the apps to determine your location from the WiFi access point with which you are connected with, and the captured information can then be deciphered and analyzed by the developers, thus helping them to showcase the right information in order to locate indoors in a more precise way. Well, in case you are wondering to use it with your current phone, let me clarify you will not be able to. Most likely you will be using this and enjoying the feature in your next phone, or somewhere near the pixel-like mobile phone. All the way, Google this time is eyeing notifications and had managed to make them somewhat smarter and sophisticated. 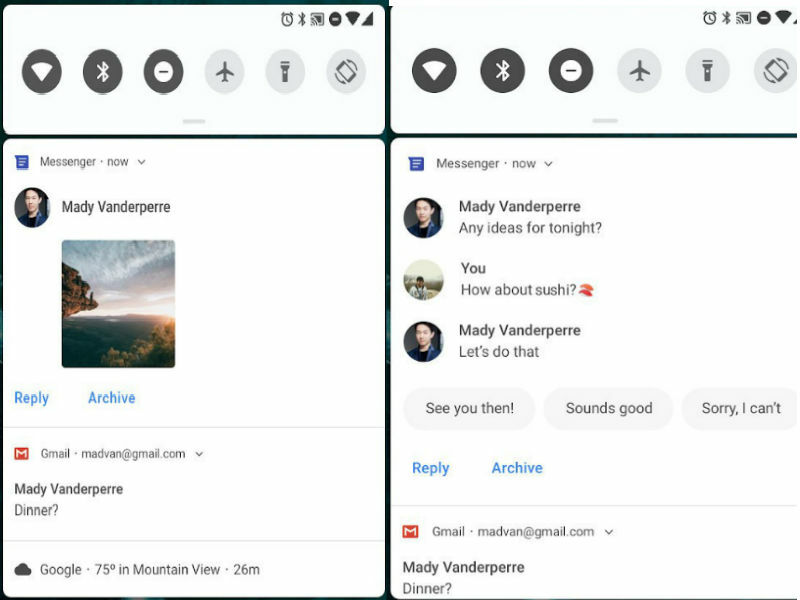 The android app developers can add the notification window for different messengers or for the one that is your favorite with the aid of Android P.
Now all the attachments and that dreaded message” you received a message or the person has sent you an attachment” will be vanished. The users can directly see and reply to the message from the notification window itself. This is just an initiative of the Google towards improvising the notifications and how well, the developers will use and implement this feature is still a question? But certainly, the smart reply and texting system will be major limelight for the upcoming Android devices and if you are lucky enough, who knows you may even enjoy this feature in your already existing smart devices as well. Android P for sure is flooded with plentiful or security and authenticity related concerns. Well, as of now there are several things that are running and will enter the mainstream soon in order to fix privacy-related concerns. Till now, the biggest amendment is that: now the camera, sensors, and microphone will not respond to the app once it is marked as idle. Do not get confused that all of them will not respond to your overall device, it simply means that the particular app will not be able to retrieve data from any of the stated three sources. Furthermore, Google is planning to introduce a high-end backup infrastructure for shielding the client-based communications and the associated MAC address. But here let me tell you, that these features will only be made available when the later versions of the Android P will be revealed. This time Google is taking the security on a further elevated level, the apps this time will be accessed by the fingerprint recognition systems. Of course, users can set their fingerprints on the app they want. This helps in confirming that the app is being validated by a trusted and authenticated source. Eventually, the stated feature can act as a major milestone for the mobile app developers, because this time they are required to get more indulged in developing a more polished, sophisticated and robust UI for the apps. Out there, we can witness ample of the Android-based smartphones that are embedded with multiple cameras placed at back and front so as to make the picture capturing experience alluring for the users. On this note, Google is thinking to announce an API with the Android P that will allow the developers to integrate it into their code. Following that, users will be able to use multiple cameras at a single time and will be able to discover the places in a better manner. Well, sounds really interesting, isn’t it? Now this just means everything, whether you want to take deep photos in the whichever mode portrait or landscape, more or less in Apple-like style, can overlay two images, can merge them in a way you like and I guess once you imagine two cameras working, the picture that comes in mind is amazing. There is something more in the plate as well; Google is introducing some additional support for your apps as well. It will focus on making the apps to use image stabilization and display flash attributes as well. To conclude, Google with its Android P is trying to improvise the third party or I would say external cameras. Now, it’s finally the time to get rid of the notch that keeps rotating around the app display. It is a matter of concern for the manufacturers as well since it affects the front facing gestures and the sensors that cater a notch to the display. Android P, for sure is a name that will help in solving the problem. Now, what it will do is, with the help of its inbuilt APIs it will aid the developers to engineer the best resonating UI to seal or cover the required notch. Now this proportionate to the fact that, now the apps covering the full screen embedded with the buttons on either side will easily overcome those notch surfaces hampering the display. Well, this will amuse everyone. To assist the developers, plentiful of immersive notch styles are defined in the Android P simulator so that one can process all the required testing so that a phone in the hand can be a witness without a notch on the display. Android P rolled out with a new feature called as screen-shot editor. Also called as Markup, this feature is similar to the one you discovered in iOS 11. Under this feature, users can showcase their creativity on the snapshots means; they can crop, draw, and edit the snapshots as required. The users can even draw and rotate the images for making the snapshots more attractive. The markup editor supports the shortcuts as well and allows you to edit with just a simple tap. Once done, the users can save and share the snapshot over the social platforms as well. 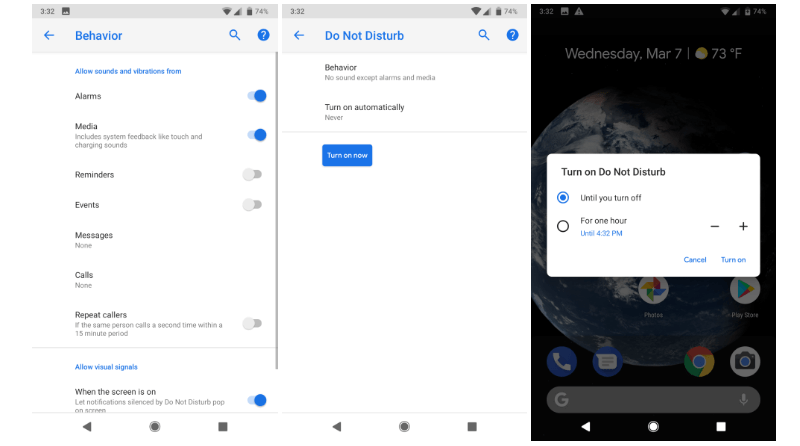 Almost most of the users are aware of the Do not disturb (DND) option. In most of the case when users are pretty much not sure about responding to a text or a call, they tend to put their smartphone on the flight mode option. Android P have vanished these traditional concepts. The DND option allows the users to set and manage their own preferences, or do they want to pick a call or not. Other than this, there is a pop-up as well that opens up on the notification window itself, thus the users are not required to keep visiting the setting page every now and then. Android P has announced an AnimatedImageDrawable that enables the designers and the developers to draw attractive GIF, WebP and other animated graphics. This AnimatedImageDrawable is more or less similar to AnimatedVectorDrawable in functionality that exists in RenderThread and acts as the backbone for decoding the images and also allows to update them, whenever required. The Android P caters impressive support for various HDR and high-resolution Media APIs. If you are a movie lover, for sure you will embrace this feature. You can watch the movies with the high dynamic range (HDR) plus can access those files whenever required. Now talking in the context of HEIF, the one that is popular for compressing files and also saves storage space is supported by Android P. Users can easily store HIEF files into the database. Other than this, also the files with varied formats such as JPEG can be converted to HIEF files via the image decoder or the Bitmap factory. For sure, Android P is a big release for the mobile app developers and for the users using the Android-based smartphones. Google is all the way emphasizing to deliver a submersible experience for the users and is cultivating the best practices for making your devices extraordinary and superior with Android P. Well, how the developers will make it with the Android P is still to be discovered and how much the users will love it yet to be identified, but quite far if we analyze the features and add-ons it is delivering, it will definitely have a large scale implications for Android App Development.